22 m a s s a g e & b o d y w o r k j a n u a r y / f e b r u a r y 2 0 1 9 22 m a s s a g e & b o d y w o r k j a n u a r y / f e b r u a r y 2 0 1 9 BLUEPRINT FOR SUCCESS best practices Is a No-Tip Policy Right for Your Practice? By Allissa Haines and Michael Reynolds Any business topic related to money tends to be emotionally charged. Tipping takes all that money stress and wraps it in a layer of needy validation and affirmation. It's an angsty burrito of cash and feelings. Some therapists will say tipping is absolutely necessary to the culture and business of massage. Others think it's an outdated pricing model that independent practitioners should drop altogether. 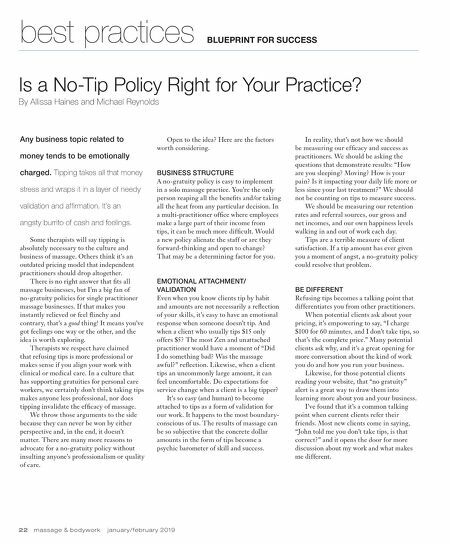 There is no right answer that fits all massage businesses, but I'm a big fan of no-gratuity policies for single practitioner massage businesses. If that makes you instantly relieved or feel flinchy and contrary, that's a good thing! It means you've got feelings one way or the other, and the idea is worth exploring. Therapists we respect have claimed that refusing tips is more professional or makes sense if you align your work with clinical or medical care. In a culture that has supporting gratuities for personal care workers, we certainly don't think taking tips makes anyone less professional, nor does tipping invalidate the efficacy of massage. We throw those arguments to the side because they can never be won by either perspective and, in the end, it doesn't matter. There are many more reasons to advocate for a no-gratuity policy without insulting anyone's professionalism or quality of care. Open to the idea? Here are the factors worth considering. BUSINESS STRUCTURE A no-gratuity policy is easy to implement in a solo massage practice. You're the only person reaping all the benefits and/or taking all the heat from any particular decision. In a multi-practitioner office where employees make a large part of their income from tips, it can be much more difficult. Would a new policy alienate the staff or are they forward-thinking and open to change? That may be a determining factor for you. 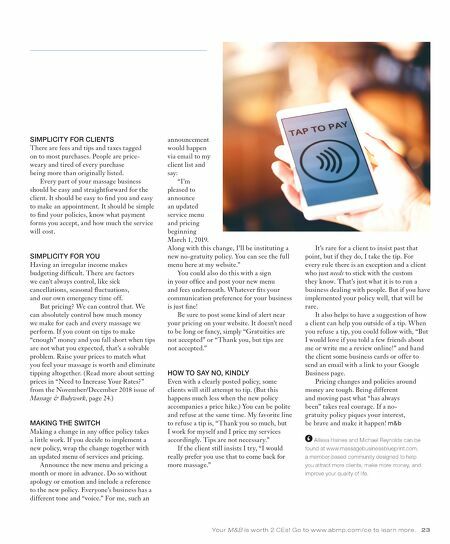 EMOTIONAL ATTACHMENT/ VALIDATION Even when you know clients tip by habit and amounts are not necessarily a reflection of your skills, it's easy to have an emotional response when someone doesn't tip. And when a client who usually tips $15 only offers $5? The most Zen and unattached practitioner would have a moment of "Did I do something bad? Was the massage awful?" reflection. Likewise, when a client tips an uncommonly large amount, it can feel uncomfortable. Do expectations for service change when a client is a big tipper? It's so easy (and human) to become attached to tips as a form of validation for our work. It happens to the most boundary- conscious of us. The results of massage can be so subjective that the concrete dollar amounts in the form of tips become a psychic barometer of skill and success. In reality, that's not how we should be measuring our efficacy and success as practitioners. We should be asking the questions that demonstrate results: "How are you sleeping? Moving? How is your pain? Is it impacting your daily life more or less since your last treatment?" We should not be counting on tips to measure success. We should be measuring our retention rates and referral sources, our gross and net incomes, and our own happiness levels walking in and out of work each day. Tips are a terrible measure of client satisfaction. If a tip amount has ever given you a moment of angst, a no-gratuity policy could resolve that problem. BE DIFFERENT Refusing tips becomes a talking point that differentiates you from other practitioners. When potential clients ask about your pricing, it's empowering to say, "I charge $100 for 60 minutes, and I don't take tips, so that's the complete price." Many potential clients ask why, and it's a great opening for more conversation about the kind of work you do and how you run your business. Likewise, for those potential clients reading your website, that "no gratuity" alert is a great way to draw them into learning more about you and your business. I've found that it's a common talking point when current clients refer their friends. Most new clients come in saying, "John told me you don't take tips, is that correct?" and it opens the door for more discussion about my work and what makes me different.